If you always have the same finish shop finish the furniture built by a certain builder, why not have that chosen automatically? That is exactly what OrderTrac does! No more wasting time looking up which finisher you always use for a builder. All it takes is 1 click to create and print/email/fax and purchase order. No more dreading that pile of orders on Monday morning. You will have them done before your coffee gets cold! You focus a great deal of attention to your monthly sales. 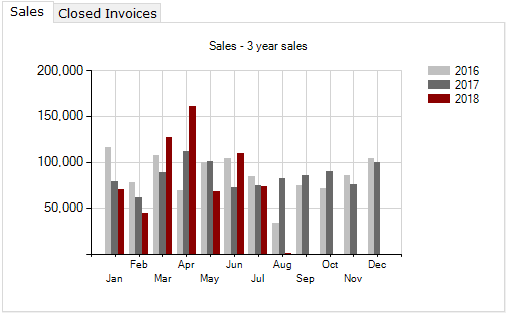 On the OrderTrac dashboard, you can review the sales graph that allows you to easily compare any month over the last several years. Wouldn’t it be nice to know at a glance how your store is doing? There are just some days you are not able to be in your store. Wouldn’t it be nice to still be in the loop? You can! OrderTrac will email you a daily status report at the close of every day, showing you the total sales for the day as well as a list of every item sold, who sold it, and all the payments received. Now you will always be up to date even while you are on your annual golf trip! When you have a returning customer say they want to order a hutch the same color as that table she purchased last year, what do you do? Start sweating and mumbling under your breath as you slowly trudge to your filing cabinet to find the one invoice with the unkown stain color on it? Stop it! You can find this information with OrderTrac in less time than it takes you to blink. No really. How many times has a customer owed you money but you forgot to collect? Well you probably have no idea because you forgot, right? Stop letting that free money fly away into the sunset! 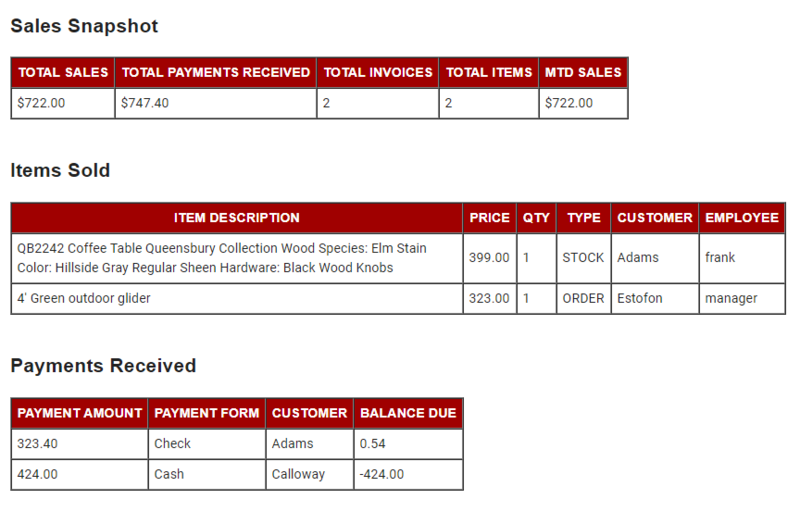 OrderTrac will remind you of every invoice that has a balance due, but yet the customer has their furniture. This would be a prime opportunity for money to slip through the cracks and never to collect, but not with OrderTrac! You earned it, now go collect it! 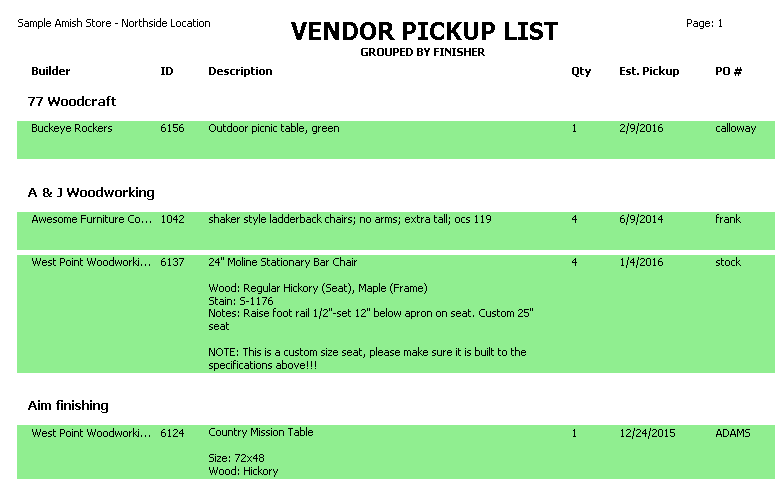 How much time do you spend putting together a list of items that will need to be picked up from each vendor? More that 10 seconds I’m guessing? That is how fast it can be done in OrderTrac. The next time you or your shipping company are ready to pick up a load of furniture, you can print the ‘Vendor Pickup List’ report in OrderTrac. This will list all items currently on order, grouped by the finish shop it will be picked up at, and identified if it should be ready for pickup based on the Requested Pickup date you specified when you ordered it. Easy, right? Do you just want to fax a quick note to a particular vendor? Easy! No need to type it out, print it, and feed it through the fax machine. 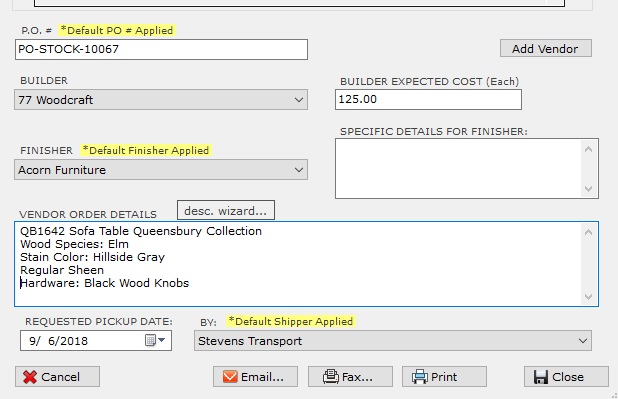 Using OrderTrac’s integration with Interfax.net, you can fax messages as well as purchase orders directly to the vendor! It all happens in about 1 second too, so that is just another way OrderTrac will save you time. When is it that you realize a piece of furniture has been on order too long? When the angry customer calls asking why they haven’t received their furniture yet? OrderTrac will stop that in it’s tracks! The system will alert you when items are taking longer than expected. This allows you to get on top of the matter before that customer has a chance to lose faith in you. They say there are 2 certainties in life: death and taxes. OrderTrac won’t help with the first one but it can definitely help you make taxes easier. 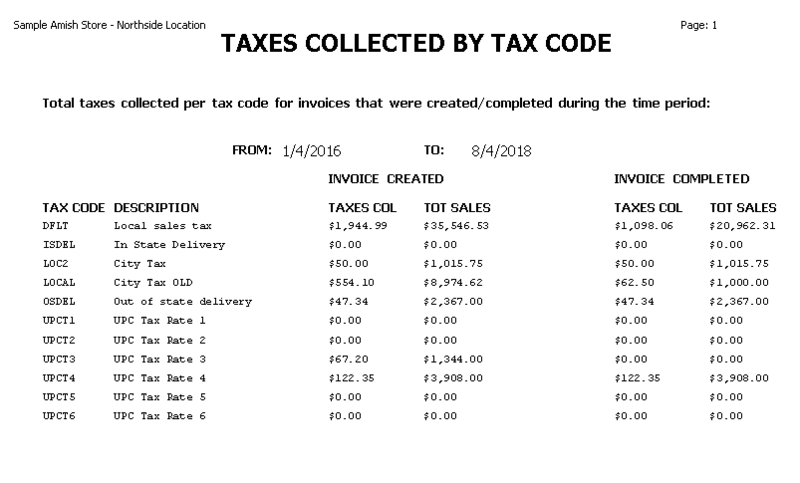 When it comes time to pay your quarterly collected sales taxes, you can run the Taxes Collected report to tell you both taxes collected for new sales and completed sales during that time period, so you can use whichever one your state requires. Oh, and this report takes about 2 seconds to run. That sure beats a stack of invoices, a calculator, and a long Friday afternoon! 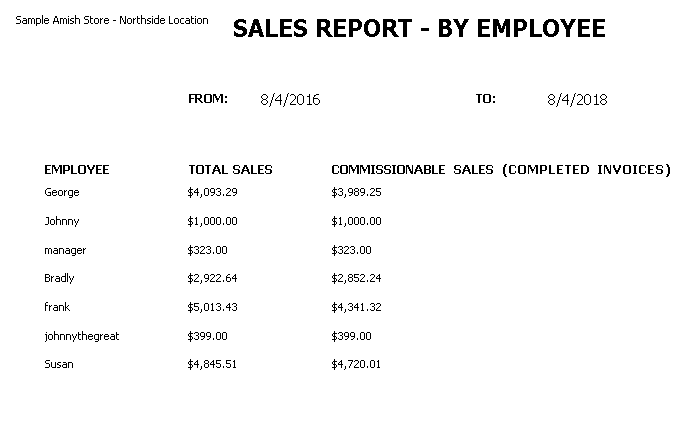 Do you pay employee commissions? Do you pay employee commissions on some items but not others? Do you pay commissions on the day the sale is created or completed? OrderTrac doesn’t even break a sweat with any of those options. No matter how you calculate your commissions and on what items, OrderTrac can run the report and have you an answer by the time you get done clicking the mouse button. Easy item filtering - drill down to find what you are looking for! 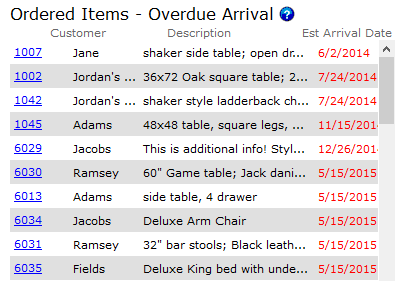 Do I have any tables on order for Inventory? Do I have any items that need to be ordered from HillTop Tables? Do I have any office chairs in stock with a price of less than $300? 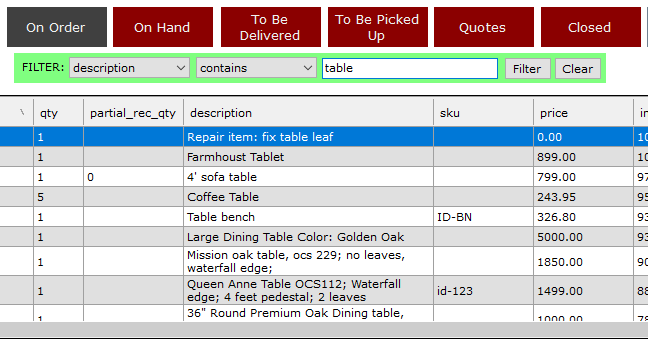 With quick and easy item filtering, these answers are just a click away. 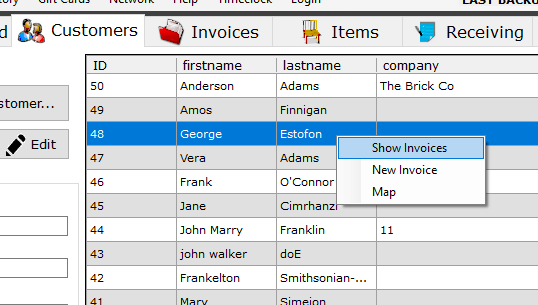 Make custom reports - really, really custom. How many tables Did I sell last year that were less than $1000 that were finished by XYZ Finishing Co where a discount of at least $100 was given on the invoice? 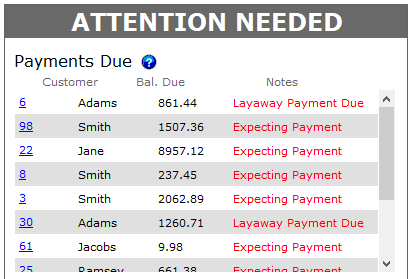 If you are inclined to know such information, or any specific data, it is just a custom report away. 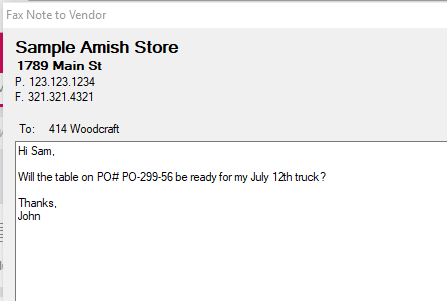 How long has that hutch been sitting in inventory unsold? That hutch has been sitting there, unsold, for quite a while now. Maybe it’s time to mark it down and get it out the door? 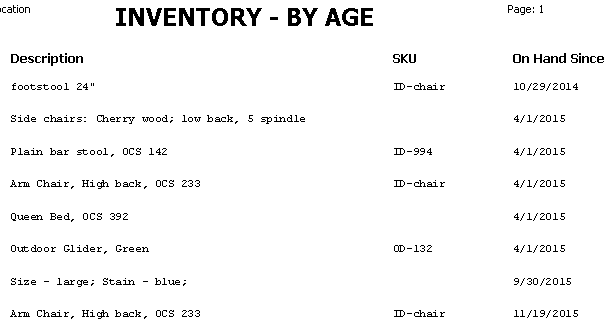 Just run the Inventory by Age report to see what has been sitting around the longest. If it is just taking up valuable floor space but not generating any sales, let’s get it out of here! OrderTrac will help you discover what needs to go. Your current accounting system will continue to handle all your financial processes — receivables, payables, banking, payroll, and financial reporting. 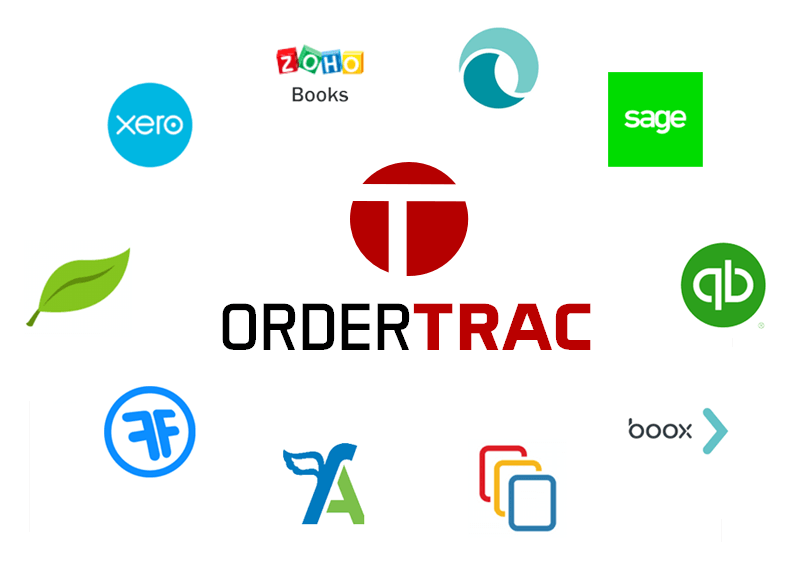 OrderTrac will operate the inventory side of your business – invoices, purchase orders, cost of good sold, etc. 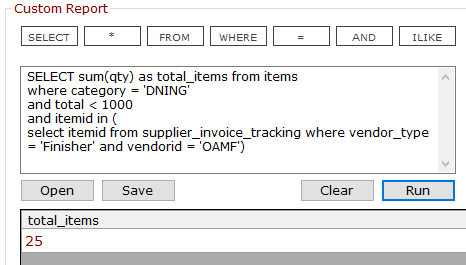 If there is data you do want to transfer into your current accounting system, you can do this from OrderTrac to your current accounting system via CSV files. This is a file format that is supported by all accounting systems, so it doesn’t matter what accounting system you have, any data can be transferred.